The film E.T. (1982) was historic. Not only was it a landmark piece of cinema, but it was also responsible for what many gamers consider the worst video game of all time. It was so bad, simply ending production wasn't good enough. Word has it that Atari scooped up millions of the returned cartridges, filled 10 to 20 semi-trucks with them and buried them in a landfill out in Alamogordo, New Mexico. But is the legend true? Joe Lewandowski, former head of a garbage company at that time, says yes. He claims that he was actually there to witness the dump. "It was the game systems, actually the game systems themselves. It was actual cartridges and games, ET and so on," he explained to KRQE. An Atari rep told The New York Times back in 1983 that the site is indeed full of gaming gear, but he didn't reveal any specifics. And so computer and video game pundits and historians have been chewing over what exactly Atari dumped in this site. Well, after 30 years, it looks like they might finally get some satisfaction. A new documentary on the E.T. game legend is digging into this mystery. That's no easy task. The rumored burial site is sealed under concrete somewhere in a 100-acre landfill. But Lewandowski says he knows the spot, and the filmmakers have been given six months to unearth it. If you're not familiar with this game, it is largely regarded as a worthless, blatant and hastened attempt to cash in on the movie's enormous popularity. 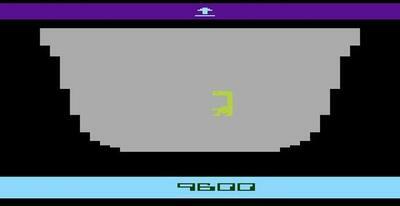 Howard Scott Warshaw was singled out by Spielberg to work on the Atari 2600 title, but he was only given five weeks to come up with something tied to the movie. After all, the all-important Christmas shopping season was at hand. What gushed forth was a wholly ridiculous mess that starred a snake with legs — er, I mean E.T. — trying to avoid the crotchety old men that were in pursuit. Problem was, once your little green creature landed in the pits, you had no idea what to do. Of course, there were no assets or in-game cinematics to offer direction at that time, so you just flung your avatar around, throwing him at the sides of the pit until finally giving up in frustration and hurling the controller at the TV. Then you switched on Gilligan's Island to decompress. For the fledgling gaming industry, which was trying to find its legs back in 1983, the game was a monstrosity that threatened its very survival. There were millions of product returns, and millions more languished on store shelves. The sentiment was so bad that many consider this one title to be a crippling blow to the whole business. E.T. has been blamed for ushering in the '80s video game crash, and it was a forerunner for other entertainment licensing hack jobs (read: crap) that would clog people's consoles for years. Part of me hopes Atari did dump that travesty into a landfill. E.T. was one of the worst blunders in gaming history, one that nearly took out the entire industry. Being buried under concrete would be a fitting end for it.